Their mothers were closer than sisters. Just published on March 31, this story of the flight-loving children of two aviation-daredevil women – one white, one black – connects World War I France with still-prejudiced USA with becoming-modern Ethiopia, as told through the school essays and journal entries of Emilia and Teo over the years. 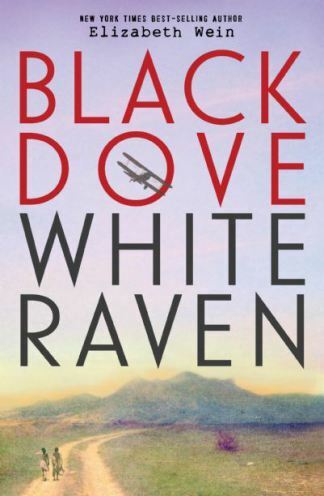 The author counts Black Dove, White Raven as part of her Young Pilots series, along with the incredible Code Name Verity and Rose Under Fire (check out the fascinating variations in cover art as published in other countries). What books about young people in wartime would you recommend? Share in the comments, please! Book info: Black Dove, White Raven / Elizabeth Wein. Hyperion Books, 2015. [author site] [publisher site] Review copy and cover image courtesy of the publisher through NetGalley. My book talk: With war edging nearer Ethiopia in 1935, an American aviatrix tries to help her adopted country and placate enemy forces while keeping her daughter Emilia and black foster son Teo safe – but some troubles cannot be flown away from. Retired from stunt flying as ‘White Raven’ when her partner and best friend Delia ‘the Black Dove’ was killed, Momma eventually moves to Ethiopia as the pair had planned, bringing her white daughter and Delia’s half-Ethiopian son in 1930 to the only African nation never conquered by Europeans. Seeing Emperor Haile Selassie crowned, meeting Teo’s uncles, living in a rural settlement and learning to speak Amharic – Em and Teo enjoy life with Momma, until the true price of the plane given to them by Em’s Italian aviator father is revealed. Will old secrets send Teo to the battle lines? Can Momma take reconnaissance photos for Italy and Ethiopia at the same time? Will Em ever get comfortable with landing the plane? ← E for Etherworld, by Claudia Gabel & Cheryl Klam (book review) – escape from virtual paradise turned hell! Sound an interesting story and I like that it’s through school essays. It’s not my usual read, but intriguing nonetheless.